Mera Peak is located in the Everest (Sagarmatha) region of Nepal. It stands at an altitude of 6476m making it the highest of all the trekking peaks in Nepal. It was first climbed 9 days before the first summit of Everest, on 20th May 1953. 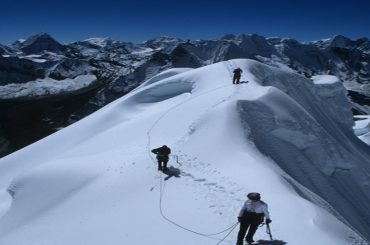 Col. Jimmy Roberts and Sen Tenzing (known as ‘the foreign sportsman’) had gone for the first Mera peak climbing. They followed the same route as us, so you will literally follow in their footsteps. 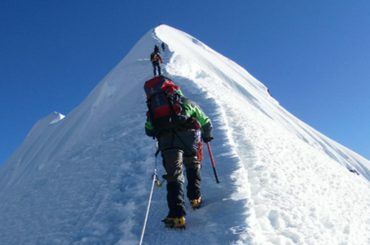 Even though it is classed as a trekking peak, it should not be under estimated. This is a high mountain and anyone attempting it needs to make sure that they are well acclimatized before making any attempt to climb it. However all the effort is worth it. 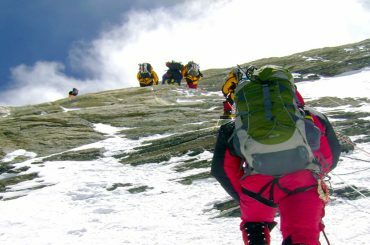 The view from the summit is considered one of the greatest in the whole Himalaya, with views to the east of Chamlang, Kangchenjunga, Makalu, and Baruntse. To the west of Cho-Oyu, Ama Dablam and Kangtega. To the north, of course, you have Everest, Nuptse and Lhotse. Everest spiking above the huge and unclimbed south face of Lhotse below. Day-03:Fly to Lukla & trek to Chutanga. 2,800m & Chutanga 3,450m, 3-4 hrs walk. Day-04:Trek to Tuli Kharka via Zatrwa La. 4,250m, 5-6 hrs walk . Day-05:Trek to Gothey. 3600m, 5-6 hrs walk. Day-06:Trek to Thagnag. 4,350m, 5-6 hrs walk. Day-08:Trek to Khare. 5,025m,3-4 hrs walk. Day-10:Trek to Mera base camp.5,350m,3-4 hrs walk. Day-11:Climb to Mera high camp. 5,750m, 4 hrs walk. Day-12:Summit day and descend to Khare. 6476m, 3-4 hrs walk. Day-13:Khare- Gothey. 3600m, 4-5 hrs walk. Day-14:Gothey- Tuli Kharka. 4250m, 5-6 hrs walk. Day-15:Tuli Kharka- Lukla . 2865m,5-6 hrs walk. Day-18:Transfer to airport and onward journey or Add Ons.